Tim Thompson has published seven photographic books, including books on the Pacific Coastline, the Alps, and Ireland. 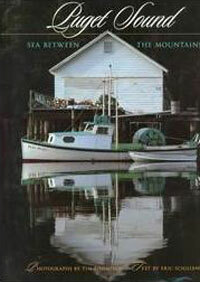 Thompson's most recent book is Puget Sound: Sea between the Mountains (2000), a photographic essay with text by Eric Scigliano. The book features beautiful photographs of forested shorelines, deer peeking out from behind ancient trees, the moon over Seattle's skyline, and breaching orcas - in other words all the elements that make this part of the country so special.